By Harlan M. Fichtenholtz & Kevin S. Labar, YaleUniversity and DukeUniversity. INTRODUCTION:- Attention and emotion are argued to be parallel processes interacting at many stages in the brain. Some brain regions are more involved with emotional response and others more with attentional control. Limbic regions act so as to bias sensory processing, and several emotional-attentional hubs are identified in the more frontal areas of the brain. The emotional system is viewed as allowing for fast orientation towards emotional or fearful aspects of the environment. 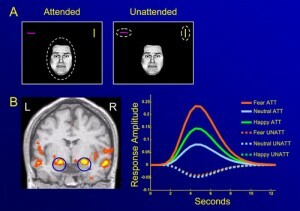 Attentional control systems are seen as allocating processing resources to those stimuli that are relevant to goal-directed behaviour. Motivational and emotional aspects are considered to drive attentional control, sensory representation and finally goal-directed behaviour. Attention and emotion are argued to be intertwined. However, these systems can also conflict, and executive processes are seen as helping to resolve such conflicts. Attention and emotion are argued to be parallel processes interacting at many stages. In particular, processing in the amygdala and other limbic areas is seen as interacting with attentional controls in the frontoparietal and the ventral visual processing stream. Emotional arousal is viewed as altering the focus of attention. Negative emotions such as fear may narrow attention onto fewer cues, while positive emotions widen the focus to help build social relationships. Spatial attention is enhanced in the case of negative emotions or anxiety, and the enhancement is more powerful than for positive stimuli. The presence of an emotional target biases both initial and sustained attention. The amygdala is the most highly connected area of the forebrain, and it interfaces with the anterior cingulate, the insula, and also the orbitofrontal cortex; this last links the amygdala with the dorsal and frontoparietal regions. Limbic regions such as the amygdala interact with the dorsolateral frontoparietal network in biasing sensory processing and initiation of actions. The emotional areas also have feedback effects on sensory processing. Feedback from the amygdala to the ventral visual stream enhances the sensory representation of emotionally significant events. The amygdala is also involved with the release of neuromodulators in the brain, and the release of stress hormones in the body via the hypothalamus. The neuromodulators released can influence attentional processing. The release of acetylcholine in the brain reduces the threshold for the firing of action potentials. In the initial stages of attention the eyes are attracted to the more emotionally related images. More sustained attention is also influenced by the emotional content of images. The emotional system is seen as operating preattentively, thus allowing for fast orientation towards fearful or emotional aspects of the environment. Some of the input to the amygdala appears to bypass the visual cortex going via the superior colliculus and the thalamus, and thus providing an early response system. Other influences may involve direct amygdala feedback onto the visual cortex, or via the emotional-attentional hubs that interface with the dorsolateral prefrontal and the parietal. Studies suggest a distinction between responses to emotion-attention tasks in the response of different brain regions. The ventral visual stream, the fusiform gyrus, the insula and the amygdala activate most in response to emotional cues, while the dorsolateral prefrontal, the intraparietal sulcus and the anterior cingulate relate more to attentional cues. Several emotional-attentional hubs are identified in the ventral and medial prefrontal, insula and anterior cingulate.